Samsung launched this new Refrigerator with 5 smart special Modes to adjust cooling that’s why its called 5in1 convertible. Five modes are 1. Normal Mode, 2. Extra Fridge Mode, 3. Seasonal Mode, 4. Vacation Mode, 5. Home Alone Mode. It means it suits you to keep you cool and keep your fruits and food items fresh in a better manner with its unique cooling adjustment feature. These five modes keeps you tension free as it provides you cooling adjustment according to your need whether it is inside the fridge or it is in the freezer. It also provides you extra storage feature by converting the freezer into the fridge whenever you need it by just a click of a button. It also has a useful Seasonal Mode feature to save energy by switching off the freezer when it is not in use. You can switch it off to cut your electricity bills. On the other side of the Seasonal Mode it may also be used with the freezer on function. It means you can use your freezer in cooling mode on with keeping your fridge off it also helps you not only to save your energy but also reduce your electricity bills almost upto 70% of the actual bill. You can use your freezer as a mini fridge for your limited uses. Switching off your refrigerator and keep freezer on feature is most useful smart feature for your vacation time means when you go out of station with your family or you are alone at home without family, then you can use your freezer as a small refrigerator and by keeping large portion of a fridge off and converting the small freezer portion into a fridge. 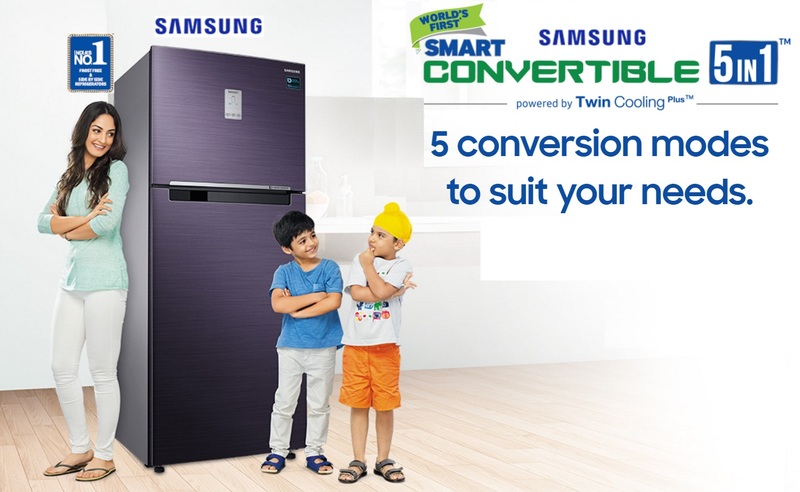 So, the Samsung 5in1 convertible Refrigerator may be a smart - useful and intelligent choice this summer. As it packs intelligent features, for the first time in any of the refrigerator. It is available for online sale as well as offline stores in the market.